This is a fun time of year to visit very high roads just as they open. Snow everywhere. I like to find new climbs, but I always remind myself to remember to revisit the best stuff. 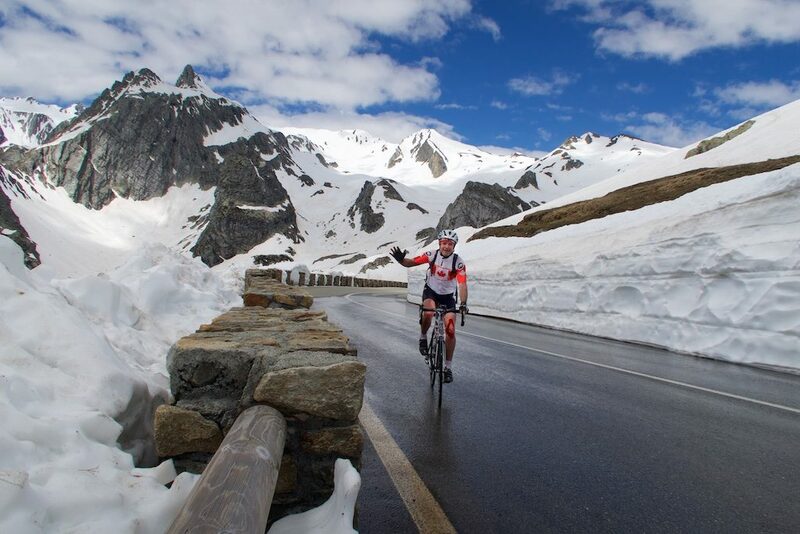 And I guessed that the recently opened Italian side of Colle del Gran San Bernardo would still have have plenty of white stuff (this route also visits the best part of the Swiss side). 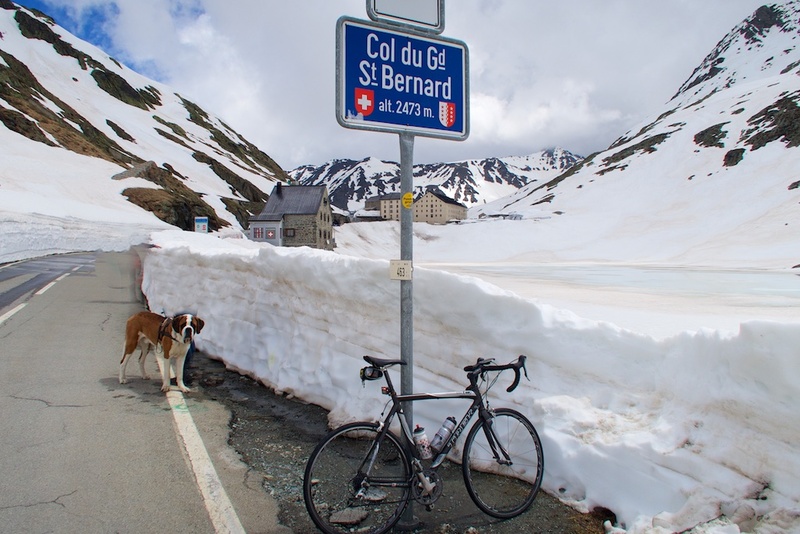 On the Swiss/Italian border, Colle del Gran San Bernardo (Col du Grand St. Bernard en français) is the 7th highest paved pass in Italy, and the 3rd highest in Switzerland. I started roughly 6 kms above Aosta (see map below) perhaps 27 kms below the summit. I could have started even lower, but the Italian side doesn’t get really interesting until the road splits roughly 14 kilometres before the Col. But there, trucks and through-traffic take a very long tunnel into Switzerland. 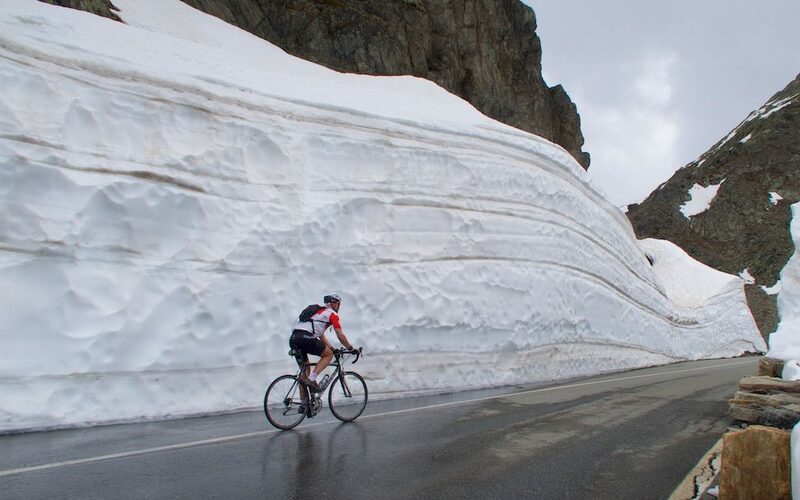 While cyclists take a fantastic, quiet, super-high road. Even after the split, it’s a wide, very good quality road. 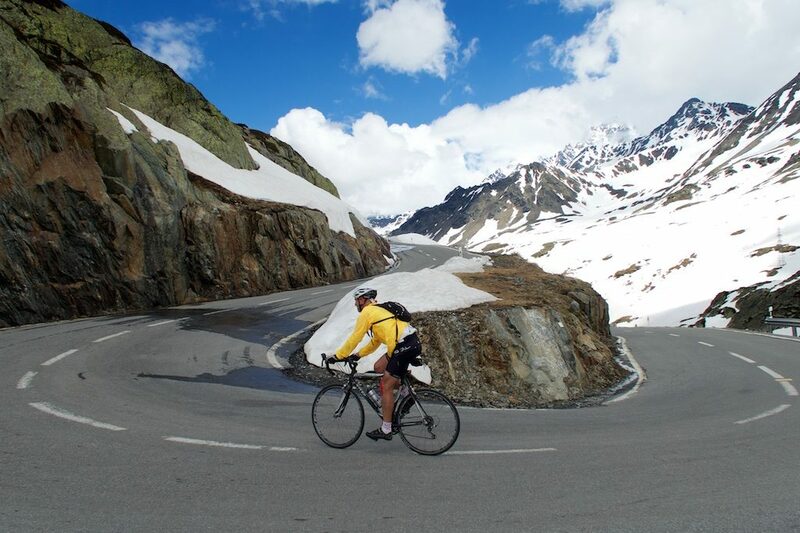 There are some nice early hairpins, but perhaps 8 kms from summit the views get interesting. The stretch in the distance in photo below is superb, but it is only leading up to an even better stretches. As I got above this stretch, I found the snow. At one point, I saw a family descending. The parents were loaded up and the two kids were very young. Wow. I stopped and yelled bravo a few times. 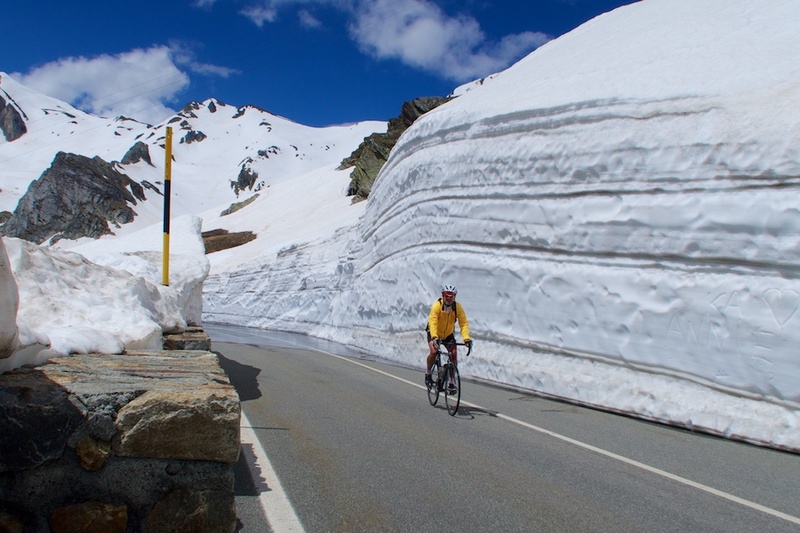 Now that’s a snow wall! This pass has been used for almost 3,000 years to cross the Alps. Julius Caesar crossed with an army in 57 BC. There is a plaque at the summit commemorating Napoleon’s crossing with 46,000 soldiers in 1800. This famous painting by David is of Napoleon at the summit (although apparently he actually rode a mule). In the 900’s Saint Bernard of Menthon opened a Hospice to provide a safe haven for travellers – the hospice is still operating today. The Saint Bernard dog was first mentioned in 1709 and has become an icon of the alps. Stuffed versions were on sale everywhere at the top. There is a dog museum at the base of the Swiss side in Martigny. Next, I descended the north Swiss side. It’s a good 43 kilometres down, but for me, most of it is not worth riding. Fast traffic that will include trucks, and some very long tunnels/avalanche thingies. So I just descended to where the car-only tunnel begins and the quiet old road splits up to the Col. Roughly 6 kms down. It’s a great stretch, and easily the steepest part of the ride with 4 kilometres at 9.5% average. This is a huge, beautiful pass. The car-only tunnel bypass keeps the traffic light. And the early season snow walls just add to the fun. Looks great! 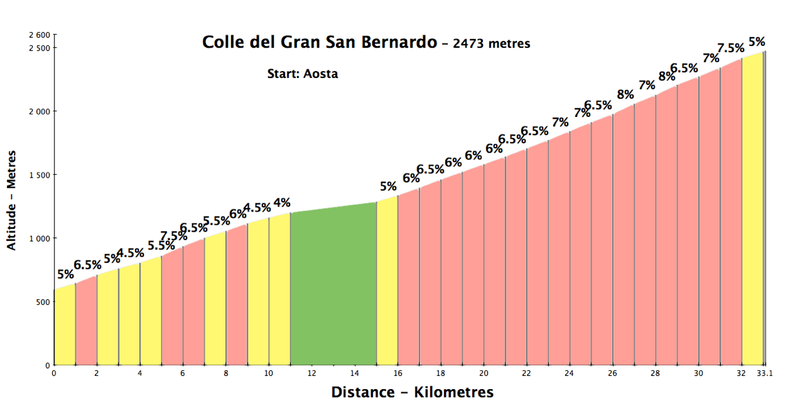 The Gran San Bernardo is on the menu July 15 for me, interested to see how it will look by then! (make sure to tick the Cols option on the map). 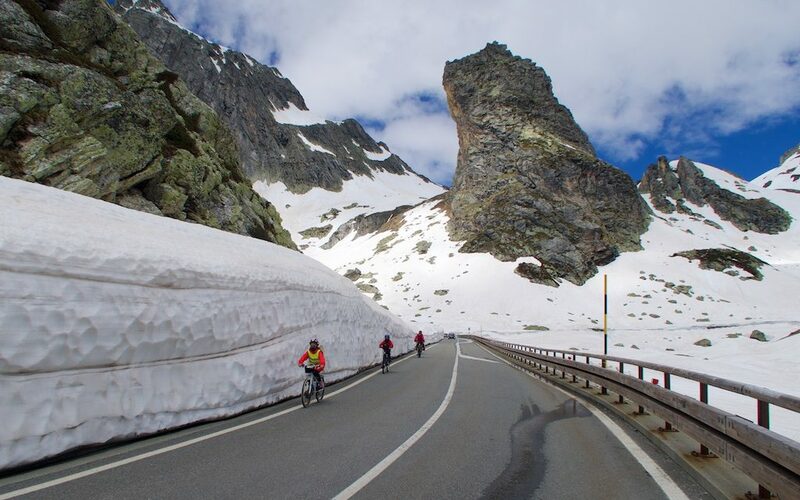 It looks like Grimsel is scheduled to open on June 10. Enjoy. Yes that was it! 🙂 Thanks! 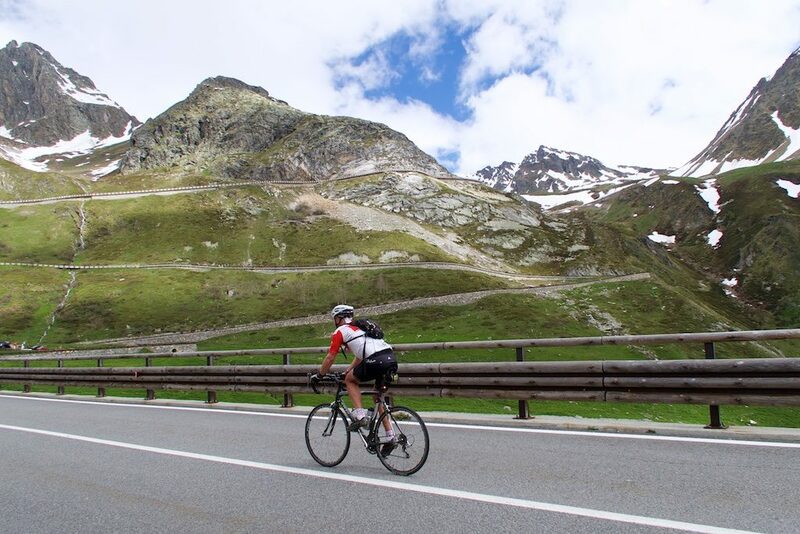 The opening times for Grimsel, Susten and Nufenen have recently changed from next weekend to June 10 indeed. However, Susten changed back from ‘June 10′ to June 11 08H’ today… I’ll try anyway, hopefully I won’t be stuck somewhere on the Susten, as I sleep in Meiringen… Exciting, we’ll see! Suggestion: when climbing the GSB from Aosta, leave aside the main road, and use instead SR17 through Porossan and Roisan. When you reach SR28 (Aosta to Valpelline) turn left as if back to Aosta for 1 km, then turn right on SR29 to Ayez, Allein, and eventually Etroubles where you join the main road for a few 100 m. As you enter St-Oyen turn left toward the river and ride to Cerisey. There you cross the stream and ride up to the main road, just before the turn-off to St-Rhémy en Bosses and the GSB. It’s pretty and quiet, you avoid all the traffic on the main road. Thanks for the hint Thomas. I just did it today – and those side roads were really great (and empty).